BODY TEMPLE, a boutique studio, provides fitness training and motivational sessions tailor made for each client to transform your body and spirit. Most of my clients need that motivation and inspiration apart from the correct workouts. We inspire and encourage you to show up for every session. 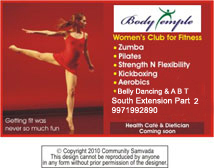 A fitness professional, Aerobics instructor, Personal trainer, Power Yoga teacher, Gym ball instructor, Dancer and Pilates expert, runs body temple in South Extension area in the heart of south Delhi . She is certified for Pilates, by Reebok and PIA (Pilates Institute of America). Specialising in mat work and Pilates on the Ball. She helps clients improve Posture, Strength, Stability and Coordination. She also helps people rehabilitate from injuries and Musculo-skeletal imbalances. Whether it is flat Abs, Toned body, Weight loss, Muscle gain, inch loss we have it all. Deepika has worked with various top Hospitals and studios in Delhi and in the fitness industry for 12 years. Working at Fortis La Femme she helped her clients regain their pre pregnancy size and weight and helped them during their postpartum days, slowly building up their strength to a level which they hadn’t experienced even before pregnancy. She taught various different fitness methodologies while at 3 graces by Amatra spa. 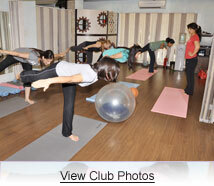 She taught postnatal fitness and Pilates with élan to the top most clientele of Delhi. Person with medical conditions like prolapsed uterus, urinary incontinence, hysterectomy, back aches. Our passion is to help our clients develop lifestyle of fitness overall health physically & mentally. A series of exercises that have been specifically chosen to help strengthen and condition the muscles that support the spinal column which help prevent or relieve backache. She has very successfully and completely healed a lot of clients of back ache with her specialised back strengthening workouts, working with people at their own fitness level and making them fitter and stronger. Keeping up with my commitment to help the women of new era my mantra is If you “Feel Good You Look Good”. At Body Temple we ensure you look good because if you look good you feel good With this mantra in mind she came up with Body Temple. Here we offer fun workouts to keep your mind and body fit and strong . 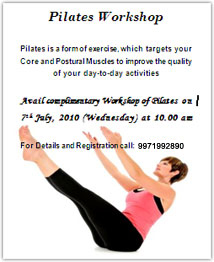 Following my post looking for Pilates a couple of months ago I joined the Pilates group held by Body Temple at GK1. I can thoroughly recommend the classes, and particularly for those looking to rebuilding core strength after childbirth or if you have any kind of back problems. It is a very safe and effective workout form, incorporating matwork as well as the Pilates ball. The instructors are very knowledgeable and inspirational, and one of the major differences from other places I've tried through the years, they pay attention to the individual needs of each person. They can tailor the workout according to your experience and/or any limitations you may have (I have a stomach hernia from giving birth and in just two months the divided muscles have almost closed up again!). Body Temple also offer other classes, among others a really fun Zumba class - also with a very good instructor who knows his stuff. I realise that this sounds like an advertisement! It's not, I am just so pleased with finding a great place and want to share it with others. The more the merrier! 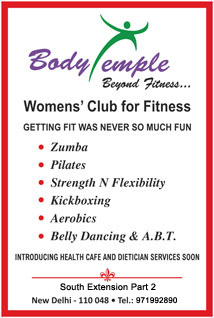 BODY TEMPLE is at: South Extension Part 2, New Delhi- 110 048.